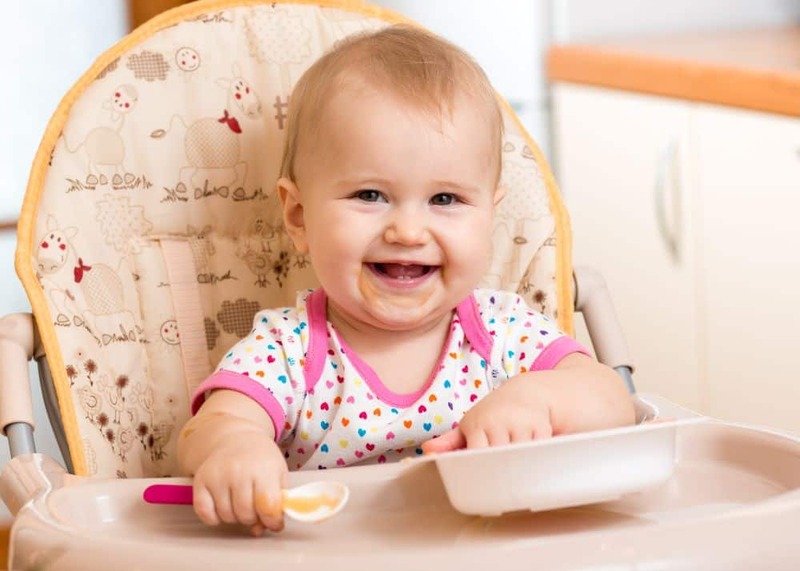 Are you getting ready to introduce solid foods to your baby? Have you been on the hunt for the perfect healthy choice for your growing little one? When it comes to choosing first foods, there are so many options on the market. If you’re considering using organic products, you’ll want to read this article. We’ll go over what makes a product organic and why you might want to choose organic products. Afterwards, I’ll share some of my favorite products on the market, and let you in on why I love them. Use the links above to check the latest prices or read our in-depth organic baby food reviews below. Why Choose Organic Baby Foods? Farms that have been certified organic go through a rigorous licensing process (source). The produce that goes into anything organic has been grown without synthetic fertilizers. While some natural bug deterrents may be used, chemically-based pesticides are also not allowed (source). There are three different categories used for organic products. Each category reflects the amount of organic material in the final product (source). 100 percent organic: If your item is labeled “100 percent organic,” every ingredient in the product was cultivated organically. Organic: If your product is labeled “organic,” at least 95 percent of the ingredients have been organically grown. Made with organic ingredients: If your item sports this designation, 70 percent of the ingredients must be classified organic. The remaining 30 percent of the ingredients are highly regulated, including a stipulation that there be no GMOs used. While we’ll look at vegetarian and vegan-friendly options in this article, meat can be labeled organic as well. When raising organic meat, all provided feed must be organic, living conditions are highly monitored, and antibiotics not used preventatively (source). There’s no single reason for choosing to use organic baby foods with your baby. There are, however, some reasons frequently cited for why people make the change. Many people feel organic products taste better. Studies show that organic foods have more antioxidants in them than their conventionally sourced alternatives (source). Many people attribute the improved taste to these extra antioxidants. In most cases, organically grown produce comes from smaller yields. These smaller harvests also maximize the use of nutrients in the soil. The end result is a more intensely flavored product (source). Growing organic produce is better for the environment for several reasons (source). Fewer hazardous chemicals are introduced into the environment: This is one of the big reasons people reach for organically sourced items. Using non-synthetic pest control and fertilizing options leaves less of a footprint on the environment. Soil health: Not relying on synthetic fertilizers means traditional methods of maintaining soil health are used. Crop rotation and crop choice help keep the soil full of nutrients to put back into future crops. Long-term sustainability: Crop-growing systems, where the health of water systems is protected and the soil is enriched, helps keep future healthy harvests possible. Preventing superbugs: The excessive use of pesticides can produce mutations that make pests more difficult to control. The same is true for excessive use of antibiotics in animals. Some people may argue that organic foods tasting better than conventionally sourced foods is subjective. The same is not true when it comes to organic farming and the environment — the positive environmental aspects are well-documented and entirely objective (source). Babies are more sensitive to the additives and chemicals that make their way into conventionally produced foods (source). Whether you’re cutting out artificial dyes, unnecessary pesticides, or growth chemicals, you’ll be exposing your baby to fewer man-made substances. Developing babies and young children experience a tremendous amount of neuron growth. Providing them with organic foods can help protect those new cells and get your little one off to the best possible start (source). If you’re like most parents, you’re paying attention to your budget. It’s true that buying organic products for your child is usually more expensive. Many organic farms are smaller, produce less per harvest, and production costs are higher. If you can only make some of your purchases organic, consider the following information. Some fruits and vegetables are notorious for the number of pesticides and chemicals they harbor. They’re even referred to as “the dirty dozen” (source). If you’re looking for places to save money with your organic purchases, consider skipping pre-packaged and processed organic foods. These usually contain other additives, like salt, sugar, and fat. The organic label won’t make these foods any healthier for you. You may also choose to use conventionally grown fruits and vegetables with peels that aren’t eaten, since they’re consistently lower in pesticides. Avocados, oranges, and watermelon are all examples of produce with inedible outer skins. If you’re looking for the produce with the lowest amounts of pesticides, look to these — “the clean 15” (source). Whether you go with organic or conventionally grown produce, make sure you prepare your food properly before eating or cooking with it. Always wash your produce thoroughly, and consider a fruit or vegetable soak to remove any dirt and contaminants. Now that you know a little bit more about organic foods — and what you should be looking for — let’s check out some of my favorite organic products. Baby cereals can be a great way to ease into solids. You can start by using cereal to thicken up formula or breast milk. You can also add it to pureed foods for a more filling meal. Earth’s Best has been in the baby food industry for more than 30 years. The company is a trusted name in baby food and has an established organic line. 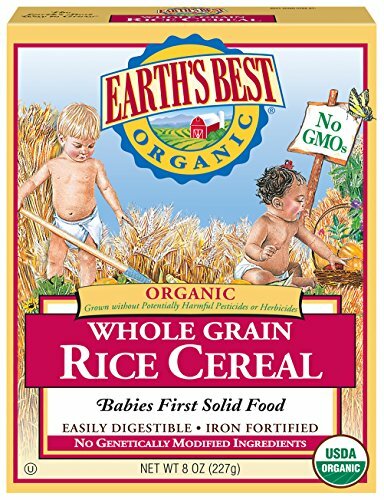 I love that the ingredients in this cereal are all natural and created to support the growth of a developing baby. This rice cereal is made with whole grains and fortified with iron. The iron is great for developing babies, and it can be hard to get from other sources. Rice cereal is often recommended as a first cereal option, as it’s easy for a baby to digest. There are no artificial dyes, preservatives, or flavors. Certified organic and GMO-free, this also has a great consistency and texture, mixing well with both purees and liquids. This rice cereal is gentle on immature stomachs. It’s easy to introduce and works well when added to other foods. No added salt or sweetener. The lack of preservatives means a short shelf life — plan to consume within 30 days of opening. Gerber is possibly one of the best-known brands in the baby business. 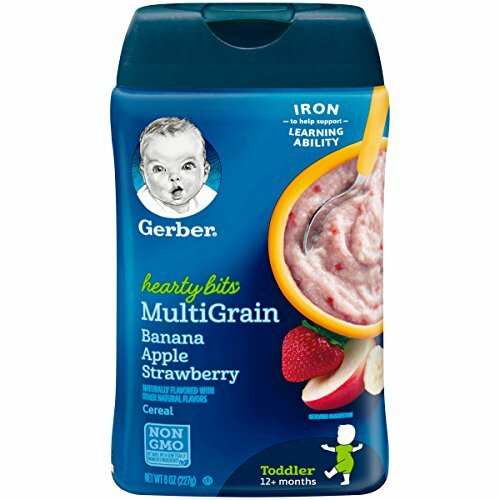 Gerber produces both organic and non-organic foods, but this single-grain oatmeal comes from the company’s organic line. This cereal is fortified with additional vitamins that are great for your growing baby’s needs. The included iron helps learning development while vitamin A supports vision and a healthy immune system. It’s also fortified with six different B vitamins, plus vitamin E, calcium, and zinc. It’s great that there are no GMO ingredients in this, either. It’s oatmeal-based, so it’s a great second cereal to introduce to an established eater. This is also a great option for mixing into a bottle before bed, or adding to a pureed food. It provides a nice texture while thickening the food, and children seem to love its taste. Heavy enough to satiate your baby for longer periods of time. Digests well for an oatmeal cereal. The pour spout is large, which can make accurate dispensing difficult during food preparation. This is an oatmeal cereal, enriched with iron and choline to help support your baby’s developing brain and eyes. The Happy Baby company works directly with pediatricians and nutritionists to develop healthy foods for your baby. I really like that this product is certified organic. It’s not made with artificial ingredients, dyes, or flavors. You can also take comfort in the fact that the packaging is entirely BPA-free. 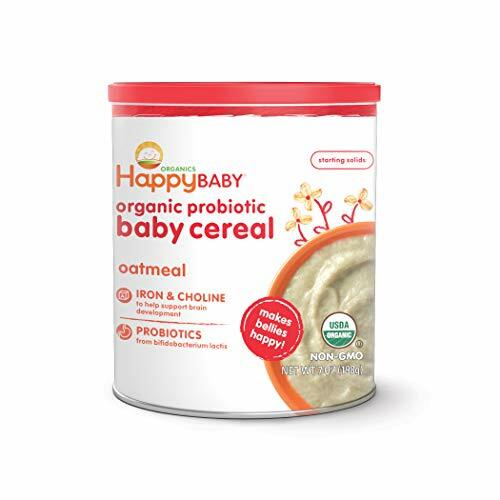 Happy Baby believes in “enlightened nutrition.” The company’s products are always free of high-fructose corn syrup, artificial sweeteners, trans fats and GMOs. This cereal can be mixed with formula or milk and then added to pureed food, to thin it out for newer eaters. If you have an established eater, you can add the cereal directly to the puree to make it a little thicker. This is versatile and fortified for optimal baby development. The added probiotics help babies’ immature digestive systems. This product doesn’t have a long shelf life and should be used within a month of opening. When your baby is ready to take the next step in solid foods, you’ll probably want to introduce a puree. These are frequently labeled according to how fine the puree is. The lower the number, the more suitable the puree is for a new eater. This variety pack of garden fresh produce is perfect for a baby who’s just learning how to eat. All of the flavor options are made with USDA certified organic foods. These purees are made with whole ingredients and cold pressed to preserve nutritional value. I also love that Pure Spoon has collaborated with pediatric dieticians to create their recipes. Pure Spoon was started by a busy mom — just like you — who wanted the best for her children when it came to their nutrition. All of Pure Spoon’s products are made in an allergen-free kitchen, with high-quality ingredients. These containers are a larger size, so they’re perfect for feeding over the course of multiple meals. They’re convenient if you’re working with several children who are a similar age, or just looking to cut down on waste. The containers can be stored in the refrigerator after opening, and can be washed and reused, plus the lids snap on easily. Great single-ingredient options for brand new eaters. Fruit and vegetable blends that encourage your new eater to try new textures. You’ll need to commit to a single flavor for multiple meals, to avoid waste. These jarred baby foods are a great option for babies older than 6 months. The jars are resealable, and all packaging is made from BPA-free materials. This vegetable variety pack includes palatable flavors that can entice even new veggie eaters. All ingredients are GMO-free and the product is certified organic. The varied textures and flavors can help satisfy your curious baby, making that first experience with solid foods a pleasant one. There are no artificial flavors, colors, or dyes here. They’re both kosher and vegan, and can easily be incorporated into any meal routine that has dietary restrictions. I like the fact that they’re all natural with no additives. The ingredients are straightforward, with no hidden sweeteners or other flavor enhancers. The food relies on its fresh organic ingredients to appeal to babies — and it does. These jars store well and are perfect for popping in your diaper bag on your way out the door. The inclusion of sweeter tasting vegetables can work as a positive transition from sweet fruits to more fibrous vegetables. These products may separate while on the shelf, so give them a good mix upon opening. Food pouches can be a great option when you’re on the go. Do you have an eater who’s beginning to gain some independence? You’ll love how these provide them that opportunity while managing to avoid the accompanying mess. This apple, pea, and spinach medley can be a great option for getting in those extra nutrient-rich greens. The apple provides the medley with appealing sweetness your baby’s sure to love. 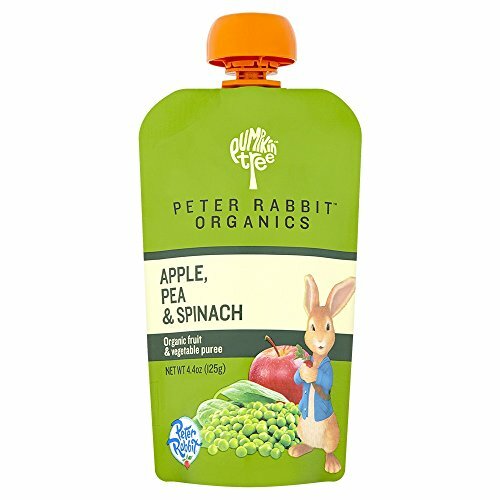 What Ilike about the Peter Rabbit Organics line is that it’s certified 100 percent organic and the packaging is BPA-free. There’s nothing hidden in the ingredients — it’s all entirely natural and made from whole foods. The sealing process for these pouches enables them to be kept at room temperature prior to opening. Once opened, they may be refrigerated but won’t keep for long. Peter Rabbit Organics doesn’t add any water to its products. Every pouch counts as a single, complete serving of fruits and vegetables. At 4.4 ounces, it’s the perfect size for an on-the-go snack. Can be served at room temperature, chilled, or warmed. Easy to consume directly from the pouch. No added water does mean the puree is thicker, which may not appeal to some children. These fun fruit and veggie medleys will appeal to a wide variety of taste preferences. Using fruits and vegetables frequently passed over, these flavor combinations offer a refreshing change of pace. 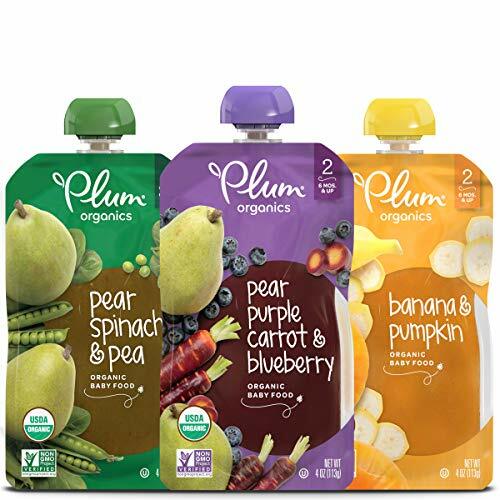 All the ingredients used in these Plum Organic products are organic. They’re also unsweetened, unsalted, kosher, and produced without any GMOs. The cap is recyclable and the pouches are resealable for those times you don’t make it through the entire serving. Just make sure to toss it after it’s been open 24 hours. This product’s packaging is entirely BPA-free. While some of the tropical ingredients are sourced from outside of the United States, the puree itself is made stateside. Ingredients are sourced locally from United States farms when possible. All in all, these are the perfect addition to your diaper bag snack stash. They also roll well from the bottom up, which prevents any unnecessary food waste. Easy to squeeze onto a spoon for those times your baby needs to be fed. Contents may separate in the packaging, so dispensing the food can be challenging. Pumpkin is frequently overlooked when it comes to baby foods. In this Happy Baby pouch, it’s the star of the show. The carrot and apple complement the pumpkin and bring the flavors into perfect balance. This product is certified USDA organic and is made without added sugars or artificial flavors and preservatives. It’s made without GMOs, and is kosher and gluten-free. I love that the pouch is fully resealable. For those times when my toddler doesn’t make it through the entire pouch (or suddenly loses interest), I can easily store it in the refrigerator. 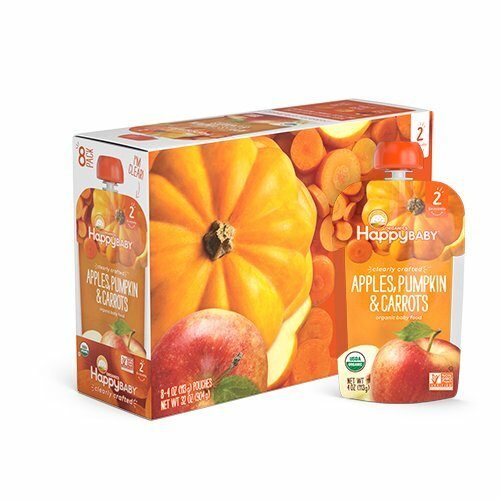 Pumpkin is a great source of antioxidants, vitamin A, and vitamin C. These pouches make getting in those extra nutrients less of a battle. When serving this, don’t microwave or boil the pouch. Opened pouches should be consumed or tossed within 24 hours. The packaging is clear so you can see exactly what your baby is eating. Made with U.S. grown pumpkins sourced from family-owned farms. The Happy Baby Organic pouches only come in single-flavor packages. For many babies, formula is one of the first nutrient sources. It can be fed from a bottle or sippy cup or mixed into purees and cereals. Different formulas are available for different age groups, to match their needs. Dietary restrictions can make shopping for formula difficult. Fortunately, if milk isn’t an option for you, there are other possibilities out there. This soy-based formula is a great alternative to dairy. You may be turning to soy to avoid milk for personal dietary considerations or because you’re dealing with a milk allergy. This formula doesn’t contain corn syrup, palm oil, or hexane-processed DHA. It’s also gluten-free, GMO-free, and made with organic ingredients. The soybeans used in this product are organically sourced and were grown in the United States. The packaging is BPA-free and the product has been rated “Best in Class” by the Clean Label Project. Great for dairy sensitivities and allergies. Fortified with iron for your growing baby’s needs. This formula is extremely foamy after mixing — it needs to settle before feeding. If you’re looking for a dairy-based formula that closely mimics breast milk, you may want to consider this option. The formula has no added corn syrup solids. It does have DHA and ARA — both naturally occurring in breast milk — to support brain and eye development. There are no artificial flavors or preservatives, and it’s USDA organic certified and kosher. Earth’s Best includes both lutein (for eye development) and prebiotics (to boost immunity). You won’t find any growth hormones, genetically engineered ingredients, antibiotics or steroids either. This formula is also iron-fortified, which is appropriate for babies younger than one year. 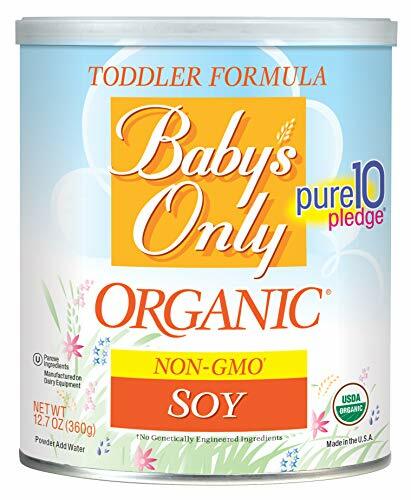 Children can continue to have formula beyond a year, but you may want to consider switching to one designed specifically for toddlers. This formula’s similarity to breast milk makes it a great option for nursing women looking to supplement with formula. 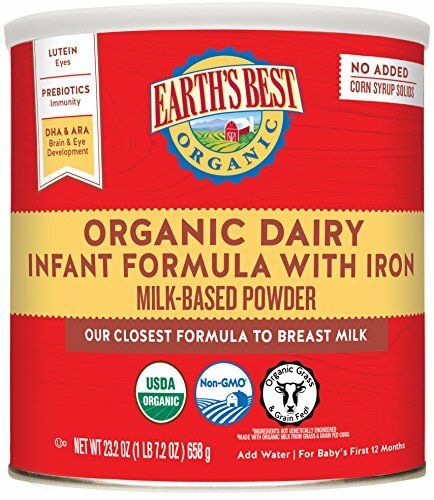 Earth’s Best has sourced its dairy from organic-compliant farmers. The formula may cause some tummy upset, especially if dairy exposure has been previously limited. There are a lot of options out there when it comes to going organic for your little one. Knowing what to look for in a product — and company — can help make your task a little easier. While all of these are a great addition to your kitchen, I wouldn’t be caught without the Earth’s Best organic rice cereal. I love how versatile it is and how I can enhance many different kinds of meals with it for my baby. Do you feed organic? What products can’t you live without? We’d love to hear your tips and tricks, so go ahead and leave us a comment below. What are the Best Toddler Tableware? What are the Best Toddler & Baby Spoons?